It’s good to know how to clean sponges because they can get really gross really quickly. That’s the short, sweet way of telling you something you already know. There’s also a longer way of saying it, which is that bacteria just love little damp cavities to grow in, and sponges are full of that. That’s why they’re so good at cleaning up other things. Fortunately, there’s a way to not only clean but actually sanitize your sponges. This is much better than the usual method most of just soaping them thoroughly, wringing them out and letting them dry. These cleaning methods won’t make your sponge last longer, but they will ensure that your sponges are always clean enough to do their job without putting back as much bacteria as they remove. Even once you know how to clean sponges, you should still replace sponges about every two weeks. It depends what kind of jobs you use them for how often you need to replace them. Pour some hot water into a bowl. Put some antibacterial dishwash detergent into the water. You can also add vinegar to this mixture. Swirl the sponge around in the water to stir up the detergent and make suds in the water. Now start squishing the sponge between your hands to squeeze as much soapy water through the sponge as possible. Do this until you feel like you’ve cleaned the sponge thoroughly. Rinse the sponge in clean water (a medium stream from the faucet is perfect), squeezing the sponge repeatedly until no suds are coming out of it. Do these additional steps every two or three days of the sponge’s life – or every day you use a sponge in the bathroom. 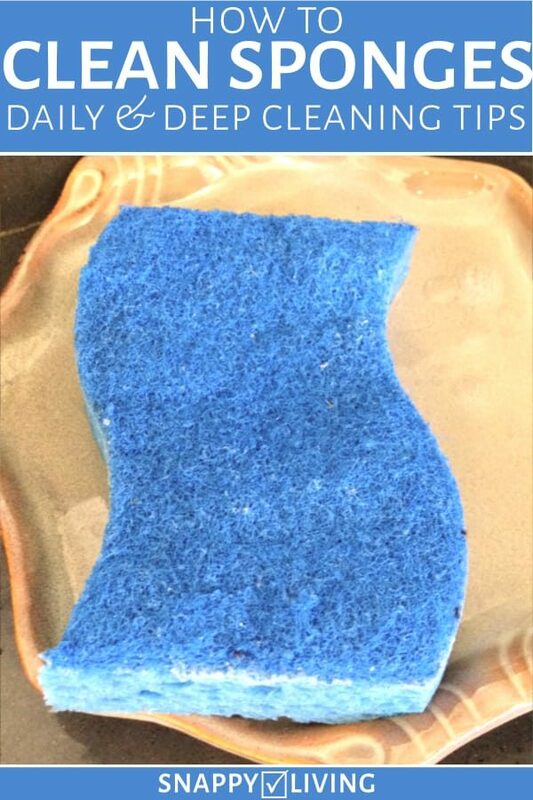 You should do it daily if you’ve been using your sponge for something particularly dirty, like cleaning a floor. Once a week is fine if you just use it for scrubbing cooked food off dishes or cookware. Put a little bit of bleach in some water. Put the sponge in the bleach solution and leave it there for a few moments – long enough to get thoroughly saturated. Rinse the sponge under clean water. Leave it sopping wet for the next step. Put it on a paper towel in the microwave, and microwave for about two minutes on high. You’ll need to monitor this carefully the first time you do it, since different brands of sponges and microwaves will react differently. Watch for any signs of burning or melting, and turn off the microwave immediately if you see them. If you can’t microwave a particular sponge for more than one minute without signs of burning or melting, try putting it in a dish of water (preferably clear, so you can watch) and put that in the microwave. Once it’s done, open the microwave door and let the sponge sit for a few minutes before you try to touch it. It will be extremely hot, so be careful! You can also get it out with oven mitts if you want. Just treat it like something extremely hot coming straight out of an oven. An alternative to the microwave is to put them in with the laundry, but only after you’ve bleached them to make sure the worst of the crud is gone before tossing them in with your clothes. On days when you’re not doing laundry, the microwave will work. Now, supposedly, the bleach and the microwave both sanitize the sponge, so you don’t need to do both steps if you’re in a rush. But once you’ve learned how to clean your brand of sponges in your particular microwave, it’s so quick and easy to do both steps that you might as well, just to be safe. If all this has turned you off to sponges, welcome to the club. I actually stopped using them a few years ago because there are better ways to do most cleaning jobs without having to worry about bacteria infesting my cleaning tools. I prefer dish brushes, which you can just set in a bleach solution occasionally and keep using for years. And I use dish towels for kitchen jobs. I soak the sponge in white vinegar and water. I leave it in there for a little while to let the steam help clean the microwave. I believe that vinegar also kills germs.